Refer to the Glossary for further definitions of key terms used in this Manual. CSA Standard (“the Standard”) means the CSA Standard A123.21 Standard test method for the dynamic wind uplift resistance of membrane-roofing systems (latest edition). Ballast, when used in this Manual, refers to a material used for securing the roof assembly. When gravel or pavers are used in this way, they are considered part of the roof system. Overburden is any material, structure or item of equipment that is placed on top of the completed roof. Gravel or pavers are considered to be overburden when they do not serve to secure the roof system. See also 14.1.1 Definitions. Wind that compromises the membrane of a waterproofing roof assembly often results in leaks, sometimes with catastrophic consequences. Therefore, the Design Authority must pay attention to the design of the roof and its performance under windy conditions. material substitution (applicable to Tested Assemblies or assemblies with proven past performance). fastener and adhesive application (minimum numbers and spacing). roofs installed with overburden, Protected Membrane Roof Assemblies, and roofs where only part of the system must be replaced. The following Standards are illustrated in the decision tree/flow chart shown as Figure 3.3, and must be read in conjunction with 3.3 Application. The Design Authority is responsible for the proper calculation of Specified Wind Loads for a waterproofing roof assembly , regardless of its design, and must use the Wind-RCI online wind calculator or, in the alternative, another method that is its equal or superior. This includes roofs that support an overburden, including Vegetated Roof Assemblies. When the geometry of a building exceeds the capabilities of the Wind-RCI calculator, the Design Authority must calculate wind loads in accordance with the BCBC, Division B, Part 4, 4.1.7 Wind Loads, and in consultation with other sections of the BCBC as they pertain to the determination of Specified Wind Loads. Acceptance of a roof for a RoofStar Guarantee is predicated on the assumption that the Design Authority has performed Due Diligence with respect to Specified Wind Loads and the attachment methods for the roof assembly. All waterproofing roof assemblies shall consist of the following three zones, illustrated in Figure 3.1. Field (F) – the interior of the roof bounded by the Edge and the Corners. Edge (E) – defined as 10% of the building width or 40% of the building height, whichever is less. In no case will perimeter zone be less than 2.0 m (7'). Corner (C) – part of the perimeter but not less than 2.0 m x 2.0 m (7’ x7’) in size. The corner area is defined by the Edge in both directions at the corners. a Tested Assembly (see 3.3.1.1 Tested Assemblies). a roof assembly with ‘proven past performance’ (see 3.3.1.2 Roof Assemblies with Proven Past Performance). engineered methods and patterns (see 3.3.1.3; also refer to Div. B, Part 4 and Part 5, BCBC together with the ANSI/SPRI WD-1 methodology referenced in the BCBC, Notes to Part 5 – Environmental Separation, A-5.2.2.2.(4)). The wind uplift resistance capabilities of the selected roof assembly must equal or exceed the Specified Wind Loads. A roof consisting of a single elevation, divided into smaller roof areas by means of control joints (roof dividers) or expansion joints, shall be considered one roof area for the purpose of calculating the Specified Wind Loads. the Specified Wind Load for each roof area must be calculated separately, unless the roofs are adjacent each other and the elevation difference between roof areas is less than 1.52 m (5’). each roof area must be designed with Edge (E) zones on all sides, and Corner (C) zones at each outside and inside corner, irrespective of the elevation difference between the roofs. 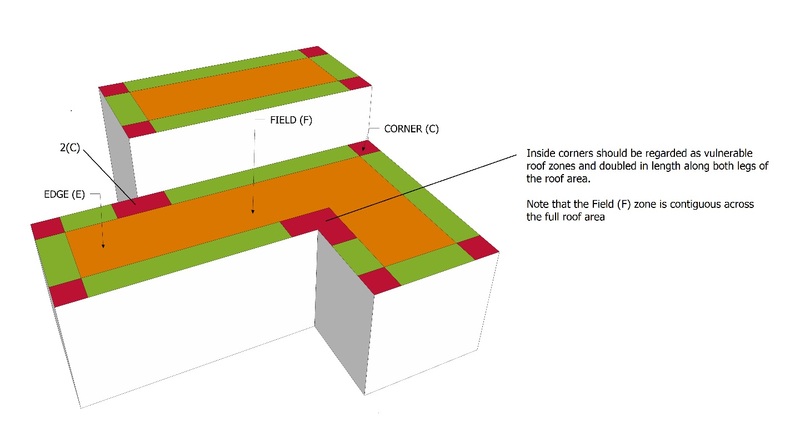 When a roof includes an inside corner, the Corner zones must extend along each adjacent side of the roof a distance equal in dimensions to outside corners (Figure 3.2). When a roof area intersects the corner of a wall, the Edge zone on either side of the wall corner must be treated as a roof Corner (2 x C) (Figure 3.2). calculate the Specified Wind Loads for the roof. determine whether or not securement of the remaining roof components (left in situ) is sufficient to resist the Specified Wind Loads. determine a suitable method of securement or have the system of securement engineered. calculate and design securement for any overburden. See Figure 3.3 for an illustration of this process. See also 1.4.2 Replacement Roofing, 3.3.3 Partial Roof Replacements and 14 THE ROOF as a PLATFORM: Coverings, Living Spaces and Structures. When specifying securement for a partial roof replacement, mechanical fastening, when practicable, is the recommended method for securing new materials to an existing roof system. All other methods of securement must be designed and specified by the Design Authority. Roof assemblies should be designed in conjunction with the electrical systems for the building, in order to avoid unnecessary interference with roof system securement. Placement of cables and boxes in designated trays, suspended at least 38 mm (1 ½”) below a penetrable supporting deck, is strongly recommended in order to avoid contact with roofing fasteners; fastener penetration may result in shock or fire hazard. Steel plates should not be used to shield conduit and boxes on top of or immediately beneath a penetrable deck, because the plates will interfere with fastener placement and proper securement of the roof system. See also 2.7 Electrical Cables and Boxes. Securement of water-shedding assemblies shall be made in accordance with the requirements set out elsewhere in this Manual. NOTE: the reader must consult the Design and Application requirements in 12.1 Protected and Modified Protected Membrane Roof Assemblies, together with requirements in 14 THE ROOF as a PLATFORM (with respect to Vegetated Roof Systems). When vegetation and its growing media is intended as either ballast or overburden on any membrane roof assembly, the Design Authority must, in addition to calculating the Specified Wind Loads for the roof assembly, determine the Specified Wind Loads for the Vegetated Roof Systems (VRS), and the dimensions of the roof zones, using the WIND-MVRA online calculator tool or, in the alternative, another method that is its equal or superior. Note that this online resource applies only to buildings described on the Wind-RCI website at "low rise" and of moderate height (limited to 20 m or 65 feet) with a waterproofing assembly. Designing appropriate securement of a VRS on roofs taller than 20 m (65') or with slopes greater than 2:12 must be undertaken by a licensed design professional using current wind engineering practices, and must be acceptable to the Authority Having Jurisdiction (AHJ). Securement methods and details of a VRS, regardless of building height and roof slope, are the responsibility of the Design Authority. VRSs that are not modular, and VRSs on buildings that do not conform to the parameter of the Wind-VRA calculator, must be engineered to resist Specified Wind Loads. calculating the Specified Wind Loads for the roof assembly. the RGC ballast guide (see 3.3.2 Ballasted Roof Assemblies, and 12.1 Protected and Modified Protected Membrane Roof Assemblies). the DOW 508.2 Ballast Design Guide for PMR Systems. When pavers are selected as ballast for a PMRA or MPMRA, the Design Authority is responsible for determining the support and placement of pavers to resist wind uplift. Modified Protected Membrane Roof Assemblies (MPMRAs) must be designed for wind resistance following the requirements for PMRAs and conventionally insulated roof assemblies. The Design Authority is responsible for determining the proper securement of any overburden intended for placement on top of the roof platform. For design, material and installation standards pertaining to roofs as platforms, refer in this Manual to 14 The ROOF as a PLATFORM. When a manufacturer's Tested Assembly incorporates materials (and listed alternates) that are not part of the RoofStar Guarantee Program, the Design Authority must identify appropriate substitutions for those materials from the list of RoofStar-accepted Materials and consult the manufacturer concerning compatibility with the Tested Assembly. Any variance to the above must be accepted in writing by the owner or the owner's representative, and submitted to the RoofStar Guarantee Program as part of the Guarantee record. The following minimum standards apply to any roof assembly, regardless of requirements published elsewhere. Fasteners and adhesives must be capable of securing the roof assembly components for Specified Wind Loads. corrosion resistance (contributing factors to fastener corrosion may include dissimilar metal contact, excessive building humidity, corrosive chemicals within components of the assembly, or corrosive elements provided within the building envelope etc.). Adhesives listed in a selected Tested Assembly must be used to secure applicable layers within the roof assembly. Adhesives may be substituted only with products listed in the Tested Assembly report. In the absence of a Tested Assembly, or for adhered and partially adhered assemblies with proven past performance, adhesives must be acceptable to the manufacturers of the roof assembly components. Bitumen used as a hot-applied adhesive must be Type 3 or SEBS. Step 1:	Calculate the Specified Wind Loads for the roof. Step 2: Select the type of Roof Assembly representative of the roof (conventionally insulated, or a Protected/Modified Protected Membrane Roof Assembly). Step 3: Design the securement system using available options, depending upon the type of assembly. This section breaks down the RoofStar Guarantee Standards according to these three fundamental steps. The Standards published in this section are the minimum requirements, regardless of fastener or adhesive requirements in a Tested Assembly, an assembly with proven past performance, or any other assembly designed by other methodologies. The information in this section may assist the Design Authority in better understanding the complexities of calculating specified wind loads, how wind affects a roof and each of its zones, and how to properly apply fastener or adhesive configurations for each zone and its respective specified wind loads. Specified Wind Loads are forces exerted by wind which, in the case of waterproofing roof assemblies , both push and lift the roof assembly or its components. Often, the upward or uplift forces are expressed as a negative value (negative pressure), but these are influenced by many variables including, without limitation, wind speed, building height, roof slope, wall openings, roof overhangs and ground roughness. Specified Wind Loads for membrane roof assemblies should be calculated using the available online Wind-RCI online wind calculator or, in the alternative, another method that is its equal or superior (click here for a sample report). When the Wind-RCI calculator is not suitable (as, for example, when a building exceeds 150 feet in height), the Design Authority must refer to the BC Building Code, Div. B, Parts 4 and 5 for further guidance. The report generated by the Wind-RCI calculator will specify the wind loads for the corners, the perimeter and the roof field. These zone loads must be applied in Step 3 when determining the method of roof assembly securement. The Design Authority remains responsible for the proper design of a membrane roof assembly, regardless of its method of attachment. Refer to the BC Building Code, Div. B, Parts 4 and 5 for further guidance. Roof assemblies for non-conforming buildings must be engineered for proper securement to withstand wind loads. Non-conforming building roof assemblies must incorporate RoofStar-accepted materials. Methods for securing the roof depend, in part, on the type of roof. How a conventionally insulated roof is secured is quite different from the securement principles and methods for a Protected Membrane Roof Assembly. Conventionally insulated roofs that support any type of overburden should be treated like an uncovered roof, and secured accordingly (see below for options available to secure a conventional roof assembly); the Vegetated Assembly itself is subject to different securement methods, based on its own Specified Wind Loads. Protected Membrane assemblies, on the other hand, are secured completely separately. Guidance for these also is provided below. 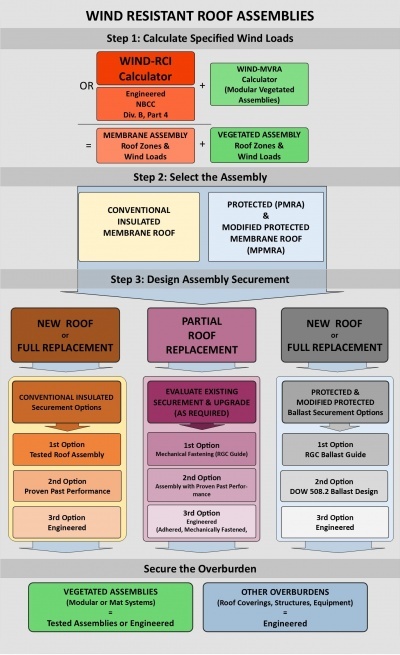 Follow the path in Step 3 that fits with your roof assembly design. Whether the conventionally insulated roof is covered or uncovered, it must be secured using one of three methods. These are presented below as a progression from simplicity to complexity, and from low cost (for the Design Authority) to high cost. If the intent of the Design Authority is to replace only a part of the existing roof system, see 2.7.2 for guidance and options. See also 3.3.3.4 below. MARS, or Mechanically Attached Roof Systems – these systems are held in place only with mechanical fasteners that are installed at the membrane layer. PARS, or Partially Adhered Roof Systems – both mechanical fasteners and adhesives are used as a hybrid method of securement; the membrane is always adhered, using an applied adhesive or heat-welding. AARS, or Adhesive Applied Roof Systems – these are roofs secured only with adhesives or heat-welded components. Only Tested Assemblies that have been tested by qualified facilities wholly independent of roof system manufacturers will be regarded by the RoofStar Guarantee Program as legitimate. Click here for a list of qualified testing agencies. To find a Tested Assembly, follow any of the links shown above. The Design Authority is strongly encouraged to specify the application of a Tested Assembly, for any design of a new roof or full roof replacement. The Design Authority must use only the test observation readings that have been adjusted for the Safety Factor. Tested Assembly observation readings, reduced by the Safety Factor, must equal or exceed the highest Specified Wind Loads for the roof. When a Tested Assembly report indicates only one system of securement, that system shall be applied to all roof zones. a Tested Assembly cannot be used. material components in a Tested Assembly are not accepted by the RoofStar Guarantee Program, and the Tested Assembly offers no suitable alternates. a material or system has not been tested. the Specified Wind Loads exceed the capacity of an available for suitable Tested Assembly. may be used for partial roof replacement. designed to exceed the Specified Wind Loads for the building . supported with a signed letter of assurance, issued by the Design Authority or the manufacturer of the proven assembly, that the assembly will perform as required. Approvals issued by FM Global or another underwriter, for roof assemblies capable of resisting the Specified Wind Load of the Project, may be given consideration by the RoofStar Guarantee Program, but must be delivered to the RCABC for review and written acceptance, along with a letter of assurance from the Design Authority or the manufacturer. When, for various reasons, a system of securement cannot be designed using either a Tested Assembly or an assembly with proven past performance, the Design Authority must have the securement system designed by a qualified engineer following the requirements of the BCBC. NOTE: the reader must consult the Design and Application requirements for 12.1 Protected and Modified Protected Membrane Roof Assemblies, and for 14 THE ROOF as a PLATFORM (with respect to Vegetated Roof Systems). Any supported overburden must be installed in keeping with the designed securement methods and systems specified by the Design Authority, and must equal or exceed the Specified Wind Loads for the roof. Vegetated Roof Systems (VRSs) constructed in modules must be secured according to the methods specified by the Design Authority. When only a portion of an existing roof system is specified for replacement, the new materials must be secured to resist wind uplift. See also 1.4.2 Replacement Roofing. Mechanical fastening is the most reliable method for securing new materials installed over an existing roof assembly. When mechanical fastening is not practicable, the system of securement must be specially engineered. When mechanical fastening is specified by the Design Authority as the securement method, the minimum number and pattern of fasteners mandated by the RoofStar Guarantee Standards published below prevail unless exceeded by another reliable method. Multiple layers of insulation that are mechanically fastened must be secured together, as if they are a single layer. steel decks at least 20 mm (3/4") – fasteners should penetrate the top flutes only. into solid dimensional lumber or plywood sheathing by at least 25 mm (1"). When mechanically attached membranes are installed together with new insulation, the insulation assembly must be held in place independently from the membrane, as shown in Table 3.3. Fasteners must be installed no more than 150 mm (6”) from panel corners, measured from each edge of the panel. Fasteners used to secure boards from curling, or to secure boards at slope transitions, shall be in addition to the minimum number of fasteners and plates required by the patterns shown in Table 3.4. Adhesives may be used to secure new roofing materials to an existing roof system, provided the specific application procedures and methods are engineered by or for the Design Authority. Notwithstanding the above, the minimum requirements set out in 7.3.2.4 apply.